Disposal bins for recycling and compost can be found throughout Rogers Place. As you walk around the Rogers Place concourse, you may notice the lack of garbage bins. Instead, you will find an abundance of bins labeled “organic waste only” and “bottles & cans only”. But what do you do with your garbage? Chances are, what you may consider garbage, is not garbage after all. “We’re diverting over 90 per cent from the landfill right now,” said Rogers Place Facility Operations Assistant General Manager, Mike McFaul. McFaul and his team have worked diligently to ensure that Rogers Place had a Waste Management and Landfill Diversion program in place for when the building opened its doors six months ago. 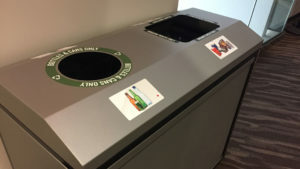 Whether you are purchasing a refreshing beverage or trying the new fan-favourite perogy nachos, you can rest assured that your waste can (and will) be appropriately recycled or composted. “We’ve made it very easy for our fans coming into the building to understand our system, which leads to very little contamination,” said McFaul. But what happens to an empty bottle after you place it in the bin? “Our recycling program is back-of-house. Cardboard, paper, wood, metals, plastics – those types of things are all sorted back-of-house and sent to a recycling facility,” explained McFaul. The compacters make transporting compost and recyclables easier and more efficient for GFL. 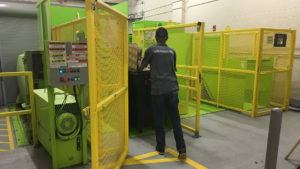 Located near the East Loading Dock at Rogers Place, the waste management room houses two compacters — one for comingling recyclables, the other for compost — allowing for easier transport by GFL. After an average Oilers game at Rogers Place, more than 70 per cent of the material collected is biodegradable organics, more than 20 per cent is recyclable paper, plastic and glass, and only 8 per cent is waste. “It was imperative from the very beginning to have sustainable operations, or high-performance building operations,” said McFaul. However, the sustainable operations at Rogers Place don’t end with the Waste Management and Landfill Diversion program. Besides using biodegradable paper towels in washrooms and manual soap dispensers — reducing energy typically used in automatic dispensers — the Green Cleaning program also ensures that Rogers Place is cleaned using certified Green products. “For the Green Cleaning Program, the LEED standard is that a minimum of 60 per cent of cleaning materials have to be certified Green. We’re easily meeting that standard,” said McFaul. McFaul’s team at Rogers Place is also dedicated to reducing the building’s carbon footprint by being mindful of the amount of energy used in its operation. From automatic lighting to operating machinery only when it is needed, the venue not only cuts energy costs, but reduces its consumption. With Rogers Place designed to meet the LEED-Silver (Leadership in Energy and Environmental Design) certification standards for a new construction building, the arena also plans to continue to meet these standards as it moves into operation. McFaul and his team continue to work towards becoming a venue leader in sustainability around the National Hockey League. So next time you’re attending an event at Rogers Place, know that the empty bag of popcorn you threw away in the compost bin may just end up in someone’s garden this spring!